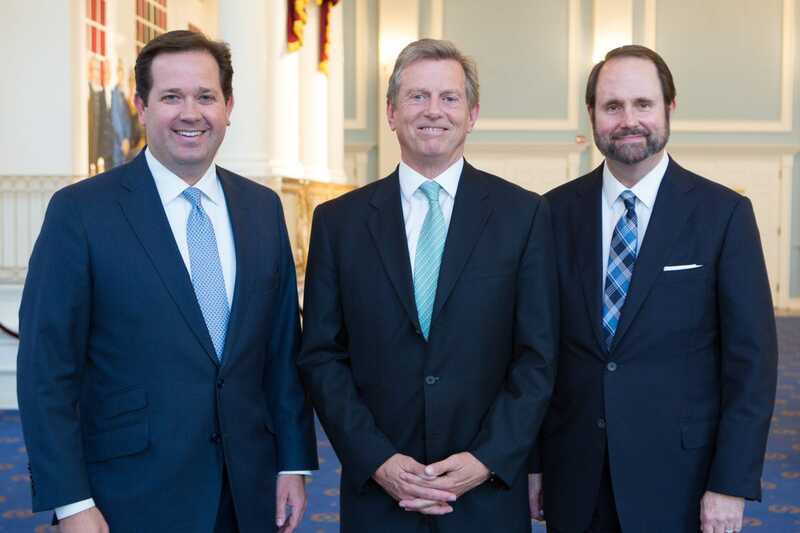 Dr. Peter Dysert with DBU President Dr. Adam C. Wright (left) and Co-founder and President of the Denison Forum on Truth and Culture and Senior Fellow for the IGE Dr. Jim Denison (right). DALLAS — Dallas Baptist University and the Institute for Global Engagement hosted Dr. Peter Dysert and Dr. Jim Denison as a part of the Institute for Global Engagement’s Leadership Lecture Series this fall. DBU’s Institute for Global Engagement began in 2014 as a Christian think tank with a focus on connecting scholars and practitioners in order to become catalysts for moral and spiritual renewal. Thus far, the IGE has hosted leaders in a variety of fields, including Eric Metaxas, Dr. Jim Broaddus, Dale Petroskey, Keith and Kristyn Getty, and Matthew Dowd. DBU was honored to continue the pattern of hosting incredible culture-shapers this September with the addition of Program Director and Chief of Pathology at Baylor University Medical Center, Dr. Peter Dysert, who has served in the medical field for over 35 years. A native of Dallas, Dr. Dysert grew up in several Texas cities and New York City, before settling in Tulsa, Oklahoma. He then graduated from the University of Oklahoma after three years, received early acceptance and entered into the University Of Oklahoma College Of Medicine. After serving an internship and residency in the pathology department at BUMC, he remained on staff and has been there ever since. Dr. Dysert began with a lecture on the topic of genetic medicine, and was then joined by Dr. Jim Denison, Co-founder and President of the Denison Forum on Truth and Culture and Senior Fellow for the IGE. The two have made numerous presentations on the topic of genetic medicine and the implications, both practically and ethically, of recent advancements. Dr. Denison, in particular, discussed the religious underpinnings of their presentation, having served for several years as the Resident Scholar for Ethics with Baylor Scott and White Health.